With Queen Limousine coming to attend a charity drag race, everyone in town has a case of royal fever, even Sparky. Excitement quickly turns to intrigue when the queen’s jewels go missing – and now every car’s a suspect. Join the world’s favorite little red sportster on a turbocharged whodunit adventure that packs more hairpin turns than an Alpine speedway – and features a shocking final twist that no one sees coming! This was a movie geared for youngsters probably aged 6 and under. My 5 year old who loves Lightning McQueen, felt this was a bit 'babyish' for him. 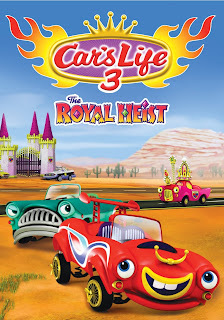 I think it was a cute show, but really would need to be for young toddlers who aren't infatuated with the 'Cars' movies. It felt like a copy cat of that movie to me.